We recently looked at a plugin called Header and Footer. This free plugin gives you a safe and easy way to add code to those two areas of your WordPress website. While that is very useful, there is another plugin which can do a similar job. This time however, the Code Snippets plugin gives you a safe and easy way to add chunks of code to the functions.php file, that is part of your chosen WordPress theme. The functions.php file contains lots of important information about how your WordPress website and current theme works. While adding your own custom code snippets to this file can help add new features, or modify the way your website works now, if you do something wrong, you could end up in trouble. As well as giving you a way to reduce the risk of breaking your website, the Code Snippets plugin also gives you, and other admin users, a quick way to see what modifications have been made to this file. Using this plugin removes the need to work on the functions.php file directly, and therefore makes modifying your website a lot more straightforward, and a lot less risky. WordPress code snippets can be found all over the web, as well as being something you may be able to create yourself. Editing the functions.php file, gives you a free and easy way to upgrade and modify the behaviour of your website. Now, by using this plugin you can take advantage of these code snippets, without compromising your website. As the Code Snippets plugin is free to use, it can be installed on your site directly from the WordPress plugin directory. To do so, log into your site’s admin area (http://yoursite.com/wp-login.php) and then navigate to Plugins > Add New using the sidebar menu. From the Add Plugins screen, enter âCode Snippets’ in the search field and then install the first item listed in the results. Once the plugin has been installed and activated, the features of the plugin can be accessed from the newly added sidebar menu item. Once you’ve found, or written a PHP code snippet, you can then create a new snippet through the Add New page of the plugin. After giving your snippet a name and adding the code, you can also write a description to help you remember the purpose of the code. This can also be useful to other users who are working on your site now, or in the future. When your snippet is ready, you can then click the save and activate button to enable it. Alternatively, you can simply save it until it is ready to go live. Your code snippets can all be managed from the Mange screen of the plugin. This allows you to instantly see their status, and either activate or deactivate them. Other features of this plugin allow you to import and export code snippets. 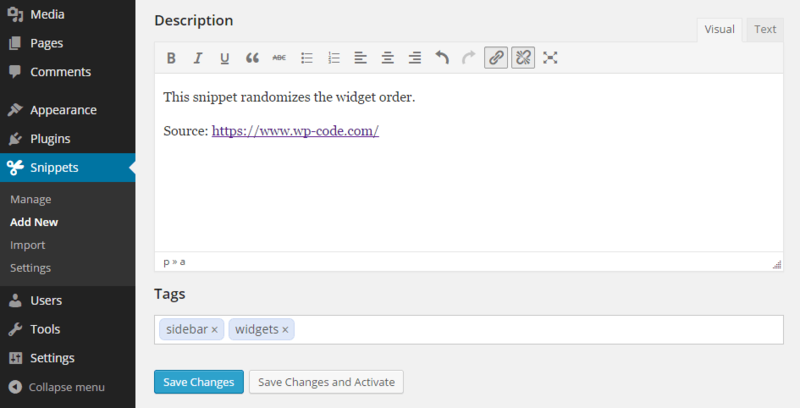 This makes it very easy to share the snippets between WordPress websites. You also get access to some settings to control how the plugin works on your website. If you want to add code snippets to your WordPress website, either those you’ve written yourself or acquired from elsewhere, then using this plugin is a safe option. Being able to easily see which snippets are active on your site, as well as having a way to add them without directly editing the functions.php file yourself, could save you a lot of problems down the road. Thanks, I haven’t heard og this plugin before, and I see a lot of potential. The option to only save a snippet, makes it possible to save more than one snippet, and then activate them one by one. I will sure install this plugin on my testsite, and use it to test snippets before I use them on live sites, you just made a tedious task easier, by pointing out this plugin, thank again. Thank you for the review, and I agreed, the plugin is very useful. However a word of caution: you should only use code in this plugin if the code is tried and tested. If the code is faulty, the plugin will BREAK your site immediately. Also, when you start migrating your existing snippets from functions.php make sure the code is never duplicated in functions.php and in code-snippets. This also BREAKS things. First take out the code (snippet by snippet) from functions.php, safe the file and refresh all caches and CDN’s. And only then load the snippet through the code-snippets plugin. Hi, I’ve been sent a code snippet to add to an existing WP plug-in to achieve the desired functionality. Will the Snippets plug-in allow me to safely add this code to another activated WP plug-in’s .php file? I’m working in a dev area – so not live – but I still want to avoid breaking the test site – so thought your description of this plug-in sounded hopeful?